Maps and News: Toquepala, Copper Mine. Elearning. Explore Toquepala, Ilabaya, Tacna, Peru through detailed Google satellite imagery. To Pan: click and drag the map. Take advantage of the search and zoom bars. 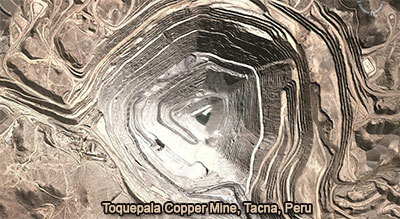 The Toquepala mine is a large porphyry copper mine in the Tacna Province, Tacna Department, Peru. The mine is an open-pit mine producing copper, molybdenum, rhenium and silver with minor gold and zinc. Read more. See also: Toquepala Open Pit Mine Art.